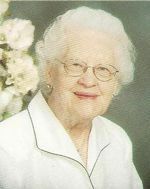 Dorothy Marcella Phillips died Monday evening, January 5, 2009 at Crystal Care Nursing Home. Mrs. Phillips was born August 12, 1914 in Ashland County, the daughter of Daniel and Amelia C. (Sprang) Young. On June 9, 1956 she married Carlyle (Phil) Phillips. She lived most of her life in Ashland and worked at the Ashland County Treasures office retiring in 1977. She was also a member of Trinity Lutheran Church. She was preceded in death by her parents, husband Carlyle (Phil) Phillips, brother Carl F. Young and sisters; Florence Fox, Elizabeth Hunt and Hortense Culler. Mrs. Phillips is survived by step- son James (Charlene) Phillips of Ashland, two grandchildren; Chad (Melodie) Phillips of Navarre, Florida, and Megan (Roy) Miller Jr. of Millersburg, along with three great grandchildren; Cassidy and Brook Phillips and Mya Rose Miller. Also surviving are nephews Gary (Tana) Young of Lexington, KY., and Dan (Bonnie) Greegor of Perrysville, and her niece Joyce Greegor of Wooster. There will be no calling hours. Private services for the family will be at Loudonville Cemetery with Pastor Jeff Messner officiating. Heyl Funeral Home is in charge of arrangements. Memorial contributions may be made to Trinity Lutheran Church, 503 Center St., Ashland, Ohio 44805, or of your choice.